We have two designs to allow cables to exit a cabinet side. A hinged flap with a "mousehole" and a hinged flap with a brush. The mousehole works best with cable bundles and the brush with individual cables. A hinged flap with a "mousehole"; works best with cable bundles. 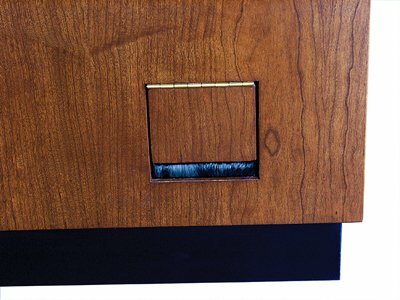 A hinged flap with a brush; works best with individual cables.